Trimese-16. Three times the fun! Honestly it looks like a blast to shoot! Tromix Lead Delivery Systems did a flashback this week to the very curious NFA-regulated Trimese-16 triple rifle. The gun, literally one-upping the infamous Siamese-16*, has three barreled uppers with interlocking gas tubes. The gas system of each feeds into the next rifle and it only has one trigger. 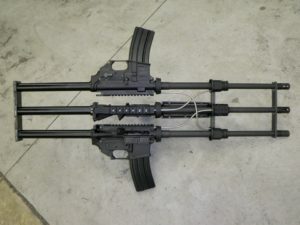 The two outer guns are slaves to the center with the triggers removed. As soon as the BCG hits home it automatically fires and the gas is routed to the next BCG in sequence to cycle it. On semi-auto, you get a three round burst. There is no way to shoot less than 3 shots at a time. All three lower receivers are full auto. The two outer guns are full auto only, the center gun is select-fire. Here it is rigged up for display at a show using pistol grips and triggers on all of the rifles. Shooter in murder-suicide used stolen gun from local shop!